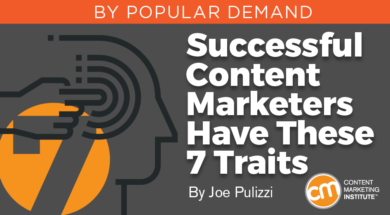 Editor’s note: While Joe wrote this piece a couple years ago, we’re bringing it back in case you missed it (or in case you want a refresher) about what makes a great content marketer. One of the most influential authors of my personal and career journey is Napoleon Hill. Napoleon Hill’s classic Think and Grow Rich was first published in 1937. Now, in the book’s 82nd year, Mr. Hill’s lessons are still extremely relevant and valuable. I had the opportunity to dust off my copy of Think and Grow Rich (from 1960, with dog-eared and coffee-stained pages) during a holiday break. In its relation to content marketing, I noticed some clear takeaways that most corporate marketers simply do not embrace. In the book, 15 powerful chapters are helpful to all individuals, but seven chapters were spot-on relevant to content marketing. Here are quotes from the seven chapters with my notes for each one. Caution from Joe: The book is extremely chauvinistic. If you read it, just prepare yourself for that. You can talk about all the things good content marketers should do to attract and retain customers – content strategy, content documentation, content integration, etc., but desire is numero uno. Everywhere I travel I hear the objection – most marketers simply do not have the desire to be THE informational resource for their customers and prospects – they don’t want it enough. They talk of content marketing as a chore … as a checklist of things to be done during the day, not as a core service to customers necessary for the company’s survival. Look, you are competing not only with your competitors, but also with the media, Google, Game of Thrones, and every other distraction in your customers’ lives. To be THE go-to resource for them, you have to want it more than anything or anyone else. This is never easy, but it is much easier for smaller businesses headed by passionate people. Simply put, there are little to no politics to deal with, and a change agent can push through and make change happen. In larger enterprises, there must be a content marketing champion who has the real desire to be the best and be given enough latitude to experiment and possibly even fail multiple times. Most large companies aren’t willing to do this, which is why smaller businesses have the ultimate opportunity when it comes to content marketing. Wanting it is one thing, but actually believing you can be THE informational expert for your industry is another. When we started Content Marketing Institute, we firmly believed that we would be the informational resource for our industry. It was unquestioned. It was only a matter of time, energy, and persistence. Rarely do you see this kind of faith with non-media companies. Corporate brands should take a page from media companies in this respect. When I worked at Penton Media (a large B2B media company) and would meet with the chief editors for our brands, they believed without question that their brand was the leading provider of information in the space. It was a non-issue … it just was. That is exactly the kind of faith you need to be the expert in your field. One of the biggest failures when it comes to content is a lack of specialization. I see HVAC companies blogging about the town festival. I see manufacturing companies creating articles on best HR practices. It hurts to see this. To be the expert in your industry, you must first define your customers’ pain points and the niche industry you will cover that will make a difference in your business and in your customers’ lives. Get laser-focused. Think of yourself as the trade magazine for your industry. Cover that. Be the expert in that area. If you are a large enterprise, you will need separate content strategies for separate audiences, not one broad initiative that makes no impact on anybody. Remember, if your content is for everybody, it’s for nobody. As Mr. Hill says, ideas are the products of the imagination. For content marketing to work, you need to embrace being an idea factory, not a content factory. Just as news organizations cover the news of the day, you need to cover the news as it relates to your industry. Take the content you have and think creatively about storytelling concepts – visual, textual, and audio – in new and compelling ways. The best way I’ve seen this work for brands is to do something creative and new at least once a quarter. Robert Rose calls this a “pillar” piece of content – something that makes a major impact on the industry and stands the test of time. That could be a book, an infographic, a documentary, etc., that works in conjunction with the regular content you produce (blog, e-newsletter, podcast, etc.). Should you use employees for your content creation efforts? Yes. Should you use customers for your content creation efforts? Yes. Should you use outside freelancers and partners for your content creation efforts? Yes. Folks, there is no one way to be the leading content expert for your industry. That said, if you have the opportunity to apply resources from a number of areas, internal and external, do it. Brands doing it right have a chief content officer (leads the content strategy), a managing editor (oversees the process), content creators (internal and external), content producers, and content listeners. In the book, Mr. Hill profiled hundreds of the most successful people in the world. Every one of them had the habit of reaching decisions promptly, and of changing these decisions slowly, if and when they were changed. Unsuccessful people, the book says, have a habit, without exception, of reaching decisions very slowly, if at all, and of changing these decisions quickly and often. Reaching decisions promptly and changing them slowly if at all is the type of mentality you need to bring to your content marketing approach. Without a doubt, the biggest reason why a content program does not succeed is because it stops. I’ve seen brand after brand start a blog or an e-newsletter or a video series or a podcast series and stop after just months. Content marketing is a war of attrition. It’s a process. Success does not happen overnight. The campaign mentality of content marketing needs to stop. When we first started our content marketing strategy in 2007, we had less than 1,000 total visits in the first six months. Now, we have over 200,000 subscribers. Persistence is key. If you want immediate results, put all your money into immediate and direct response. If you want to create an informational annuity that will pay for years, even decades, invest in some kind of content marketing approach. You can hear Joe’s great insight in his new keynote presentation at Content Marketing World this September. Register today. Use BLOG100 to save $100. In the meantime, you can hear more from Joe by subscribing to his Random Newsletter.